Today, August 21, 2007, is the last day of operations of the Baxter detention centre in South Australia, but there's no reason to celebrate. Far away from Baxter, on Christmas Island, away from lawyers, advocates, Australian courts and those annoying stirring activists, another Australian refugee jail nears completion. It humbles any undue optimism to realise that before this, during the last five years, the Curtin hellhole closed, the Woomera hellhole also closed, the Port Hedland detention centre was mothballed before being closed and sold, and the offshore, tropical hellhole on Manus Island was mothballed. And in this period, there was no significant change of policy. 27 October 2005: The Kiwi who went to Baxter - Two plain clothed policemen greeted me at the gate. They asked me to accompany them. They assured me that we were just going up the road and back. I knew I had nothing more to worry about than an overlooked traffic fine so, with curiosity and without concern I complied. Ten minutes later I was being held at the Maribynong Detention Centre. 11 February 2005 - Visiting Baxter: Joy Huson and Gareth Evans visit the Baxter detention centre - "Her case exposes the treatment of people by DIMIA, the bungling by Public Services and the "I didn't know" from politicians who surely are required 'to know'." 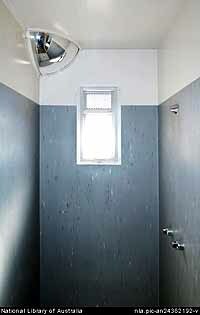 Photo: isolation cell in the Red One compound at Baxter - this is a cell where also Cornelia Rau was held. 7 January 2005: The Bakhtiyari Files - It is likely that the goings-on around the Bakhtiari case constitute one of the Howard government's biggest attempt at a refugee case management cover-up, and the fact that this was a cover-up is a lot more likely than that the Bakhtiaris were, as the Australian government stubbornly maintained, indeed Pakistanis. Recent news bulletins carried the item without much fanfare. 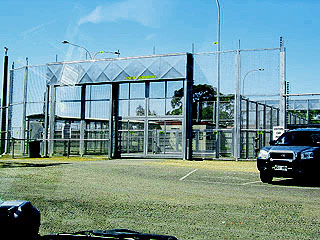 The Baxter Immigration Detention Centre would be closed by Australia's Immigration Department on August 19th, 2007. Opened in September 2002, at a cost of $40 million this 'purpose built facility' was deemed to be a suitable place in which to punish those who dared seek asylum in this country. And it would 'teach a lesson' to unknown people smugglers in unknown places. It was the start of the Pacific solution. On the evening of Sunday 19th August 2007, a group of sixteen men and women gathered opposite the main gates of Baxter to remember those who had been incarcerated by the electrified fences and computer locked doors, during the five years of its life. In a simple act of remembrance, each person spoke a few words about the feelings and memories stirring in their minds as they stood in front of this modern day symbol of Australia. Most had been involved in visiting those inside' over several years. Strong memories would last a lifetime. One person spoke of the principle of mandatory detention and the hope that Australia would see other ways to treat those who sought its asylum. A nurse who had been involved with the six women who'd given birth, while being detained in Baxter, regretted that the Australian government had seen fit to allow such a momentous event in a woman's life to occur in such abject circumstances. Each newborn babe was given a Baxter identification number to begin its life in Australia - but not Australian citizenship! A man who'd visited many detainees over five years, spoke of the dignity they displayed amidst the ongoing trauma and tragedy that was part of their lives. Another spoke about 'K', the young Afghani whom he and his wife befriended in 2003, and the joy experienced when, in an Adelaide shopping centre, they were hailed by a young man yelling out, "Mum, Mum!". The lad then enveloped his wife in a hug that told all. Another woman who had faithfully visited many young men, being their proxy mum, found it difficult to express her feelings, as she remembered many (including children) who now require psychiatric care. Another man spoke of the Tampa Incident of 26th August 2001, which raised the deepest question in life - what it means to be a human being. A lady from Brisbane spoke of her son who was living overseas at the time of the crisis. On seeing reports on TV news bulletins which flashed around the world, he admitted it was the first time he'd felt ashamed to call himself Australian. The mention of those who were deported to places from which they had fled, some facing more trauma and even death evoked strong feelings of anxiety and fear. Although Baxter was closing, closure for many would still be far away. Despite the shame, the sadness and the horror of the Baxter experience, all agreed that for those who had participated in caring for and visiting detainees, advocating for them and raising awareness in the community, it had been a valuable experience. They had seen that the human spirit will not be easily broken and that true friendships begun in adversity among a diverse group of cultures, colours and creeds will last a lifetime. On a beautiful sun filled late afternoon, the act of remembrance ended with Hope. Hope that Australia would see better days and better ways in the future. The Federal Government is to close the Baxter Immigration Detention Centre, in South Australia's mid-north, returning the facility to the defence department. But refugee advocates say the closure is no cause for celebration, saying it would simply be replaced by a new $400 million "gulag" on remote Christmas Island. Immigration Minister Kevin Andrews said the decision to close Baxter on Monday was possible because of the Government's strong border protection policies, particularly the use of the offshore processing facility on Nauru. "Stemming the flow of illegal arrivals has been a key part of the measures to make Australia's borders secure and assure the integrity of its immigration program," Mr Andrews said. The home for several hundred detainees at one stage, Baxter is now believed to hold just 12 people, who will be moved to other immigration facilities interstate. "Of course we welcome the closure but the bigger concern is the government is building the mega detention centre on Christmas Island," said Refugee Action Collective spokesman Ian Rintoul. "Christmas Island is even more inaccessible and remote, so the closure isn't a step forward." Advocate Jack Smit, from Project SafeCom, said the Baxter closure should be seen in the light of the building of the Christmas Island detention centre. He said Baxter last week had 12 detainees managed by 80 staff. "Closing Baxter doesn't come on its own because as Baxter closes, the Christmas Island gulag opens to the tune of $400 million," Mr Smit said. "It's the most grotesque Orwellian invention and millions of dollars of taxpayers' money is getting squandered by a government which has wedged itself into a corner of human rights abuses of innocent people." The operators of the Baxter detention centre for the past three years, GSL Australia, said the closure would affect about 100 staff. GSL's managing director Peer Olszak said while some staff would be moved to other immigration-related operations in SA, there would be some redundancies. Mr Andrews said while the defence department would take control of the site, the transportable buildings at Baxter would be moved to indigenous communities to support the government's plan to protect Aboriginal children in the Northern Territory. The minister said there was a shortage of temporary accommodation for the additional government staff and services which would operate at the affected indigenous communities. "I am very pleased that the Baxter buildings can be put to good use in support of the government's commitment to the protection of Aboriginal children in the Northern Territory," he said. GSL Australia, the company which has managed the Baxter facility for the government for the past three years, said the closure would affect the jobs of 100 staff. It said while some would be moved to other immigration-related operations in SA, it was inevitable that there would be some redundancies. GSL's managing director Peer Olszak said while he understood the government's decision, the impact on workers was regrettable. "I regret it very much because of its impact on people who have served us loyally and well," he said. When they established the $44 million Baxter Detention Centre in 2002, immigration officials had learned from past mistakes. 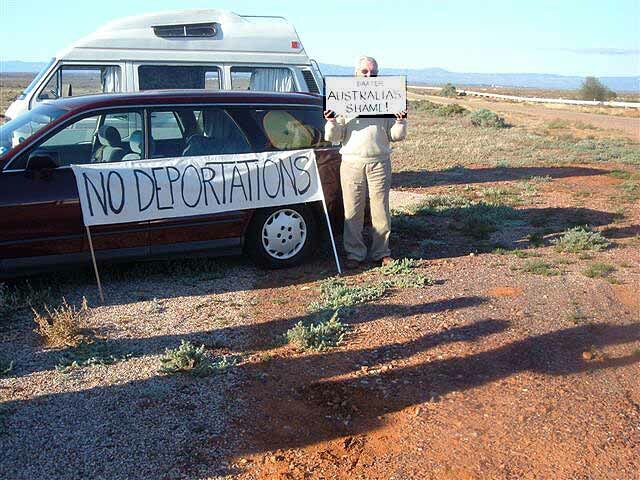 Located on defence department land near Port Augusta, in South Australia's mid-north, Baxter was far from the prying eyes of protesters and others opposed to mandatory detention for asylum seekers. In fact, unwelcome visitors to the complex struggled to even see the buildings and other structures, thanks to the wide perimeter guarding the mostly temporary facility. Authorities boasted on occasion that the chants and noise from frequent demonstrations would not even be heard by those inside. That was a very different situation from the more remote Woomera Detention Centre it replaced, which had been the centre of several violent protests, including one in 2002 which sparked a mass break-out of 50 inmates. But for all its isolation, Baxter has been no less controversial. Built at a cost of $44 million, at its peak it housed several hundred asylum seekers and illegal immigrants. It was supposed to offer vastly improved conditions, better living quarters, more recreation space and the chance to take part in more activities. It was also better set up for visitors, and as late as May last year the federal government was still pumping in cash, spending $5 million on a football field, basketball court and other upgrades. That seemed to matter little to those inside. Inmates regularly clashed with guards, went on hunger strikes and attempted suicide or self harm. There were rooftop protests over the quality of food and demands from some to have their immigration status reviewed. Welfare groups and visiting doctors repeatedly questioned the psychological impact of continued detention on Baxter inmates, while several court cases were launched to win the release of the worst affected. On two occasions, in 2002 and 2005, fires caused more than $2 million damage, and a July 2005 riot caused more than $70,000 damage. Baxter was also home for four months to Cornelia Rau, the wrongly detained Australian permanent resident whose case sparked a major review of the federal government's detention arrangements. Outside, protest groups converged on the centre in 2003 and 2005, and while they failed to get close they caused problems for South Australian police. In 2003 there were 32 arrests for behavioural offences, while in 2005 about 400 protesters clashed with authorities, leading to 16 arrests for trespassing and hindering police. But now that it is gone, refugee advocates and other welfare groups are even more fearful of what will take Baxter's place. Refugee Action Collective spokesman Ian Rintoul said he welcomed Baxter's closure, but of bigger concern was the government building a mega detention centre on Christmas Island. "Christmas Island is even more inaccessible and remote, so the closure isn't a step forward," he said. Refugee advocate Jack Smit, from Project Safecom, expressed similar concerns, describing Christmas Island as a $400 million gulag. United Church chaplain Adam Tretheway, who conducted the last worship service in Baxter today, said while he was glad to see it closed, at least support could be offered to those detained on the Australian mainland. "We are very concerned for the people who will be sent to the Christmas Island centre and for those processed on Nauru," Rev Tretheway said. BAXTER detention centre, where many asylum seekers' dreams of a new life in Australia faded away behind the razor wire, has been closed. The Federal Government said yesterday it would close the controversial centre, which last week had 80 guards watching over just 10 occupants awaiting deportation following criminal convictions. The isolated detention centre near Port Augusta, South Australia, opened in 2002 with electric fences and microwave surveillance. At its peak it held several thousand detainees, including the Bakhtiyari family deported for allegedly falsely claiming to be Afghan refugees, wrongly detained mentally ill Cornelia Rau and stateless Peter Qasim, detained for nearly seven years. Immigration Minister Kevin Andrews said Baxter was no longer needed because the Government's border protection policies, and use of the offshore processing facility on Nauru, had stemmed the flow of illegal boat arrivals. Baxter is to be returned to the Department of Defence and its demountable buildings used by the Government's emergency response for the protection of Aboriginal children in the Northern Territory. Baxter was the subject of demonstrations, hunger strikes and suicide attempts. But it came under the national spotlight when it emerged that staff failed to pick up or treat Ms Rau's mental illness and held her in solitary confinement. This led to the Palmer report recommending improved access to doctors and psychiatrists. Adelaide barrister Claire O'Connor said more than 50 detainees had been transferred from Baxter to Glenside Psychiatric Hospital over four years and many of those released remained psychologically damaged. The Asylum Seeker Resource Centre's campaign co-ordinator, Pamela Curr, welcomed Baxter's closure, saying "95 per cent of the asylum seekers incarcerated in these hellholes were granted visas. A shameful, expensive period of our history has been drawn to a close." THE state-of-the-art Baxter detention centre, modelled on a Supermax prison and designed to quell detainee protests and keep human rights activists at bay, will close on Monday after five years. The Government will return the $40 million facility to the Department of Defence, which previously operated the El Alamein army training camp on the site. The centre was a "remarkable new development in institutionalised detention regimes", when it opened in 2002, according to Dr Zachary Steel, who has researched the effect of detention on the mental health of detainees. "It stopped overt protest but it didn't stop the crippling psychological damage of detention," Dr Steel said. "In terms of the wellbeing of detainees, they couldn't see out, they could only see up." It could accommodate 660 detainees and had a contingency capacity for an further 220. In recent months, detainees have been moved to other centres in Melbourne, Sydney and Perth. The facility now houses 10 detainees watched over by 80 guards, a refugee advocate, Pamela Kerr [sic], said. Building the facility had been an overreaction by the Government, she said. "Since 2001, an average of 30 people a year have arrived on our shores. The 83 Sri Lankans pushed that up to 45. There was some overkill on the bed capacity." The Minister for Immigration and Citizenship, Kevin Andrews, said the Government's border protection policies, particularly the use of the offshore processing facility on Nauru, had reduced the need for such detention facilities. Referring to the asylum seekers as "illegal arrivals", he said "stemming the flow had been key to making Australia's borders secure and assure the integrity of its immigration program". Advocates say most arrivals were eventually acknowledged as legitimate refugees and given protection visas, some after spending years in detention. 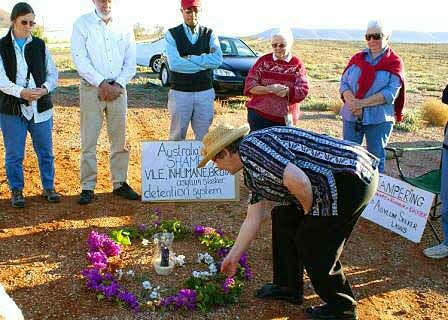 Nuns and other refugee advocates held a twilight vigil at the Baxter Detention Centre last night ahead of its official closure this morning. 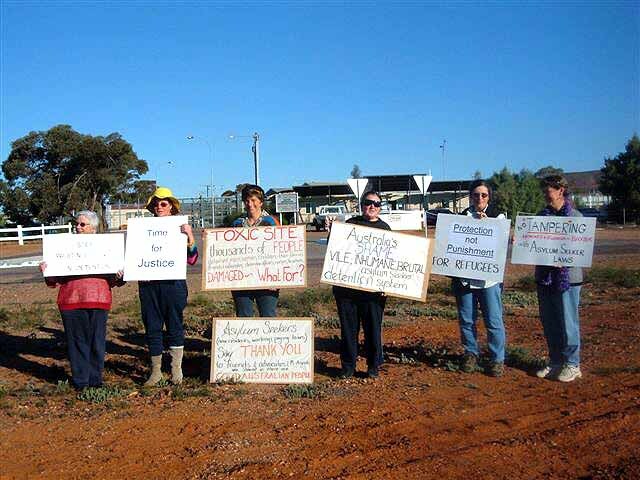 Members of Rural Australians for Refugees and the Sisters of Mercy met outside the facility near Port Augusta to remember their involvement with detainees over the past five years. Sister Claudette Cusak says while Baxter is closing, it is important to remember the detainees in other centres around the country. She says the group felt the vigil was a way to farewell an era. "It's just to mark the closing of Baxter, to acknowledge the suffering and trauma that that place has caused," she said. "But also we remember that the great friendships and love that has been as a result of that place." The 12 remaining detainees at Baxter will be taken to other facilities interstate, and the land transferred to the Defence Department. Australia has closed a controversial immigration detention centre that has seen violent demonstrations and suicide attempts by asylum seekers. The government said the decision to shut the Baxter Detention Centre in South Australia reflected its success at stopping illegal immigration. Refugee activists insist the closure of the camp had ended a "shameful period in Australian history". Campaigners held a vigil outside the centre as it was decommissioned. They were there to remember what they said was "the suffering and trauma" the facility had inflicted on countless inmates. The isolated camp near Port Augusta, north of Adelaide, opened five years ago. It was part of an uncompromising policy towards asylum seekers, especially those that arrived by boat from Indonesia. They were automatically locked away while their claims for refugee status were investigated. The centre once housed several thousand detainees behind its electric fences. It was beset by demonstrations, hunger strikes and suicide attempts. Australia's conservative government now believes it has the upper hand in its fight against illegal immigration, and has said that Baxter is no longer needed. Ministers have insisted their current policy of sending boat people to a camp on the tiny South Pacific republic of Nauru has been a powerful deterrent. Keeping asylum seekers away from the Australian mainland is seen by the government as an efficient way of protecting its borders. That approach is being reinforced by the construction of another offshore processing centre on Christmas Island, a remote Australian territory in the Indian Ocean. One refugee activist has described the project as "a grotesque Orwellian invention". The 12 remaining detainees at the Baxter facility will be transferred to other centres. Some of the buildings at Baxter will be moved to Australia's Northern Territory as part of a programme to combat child abuse in indigenous communities.